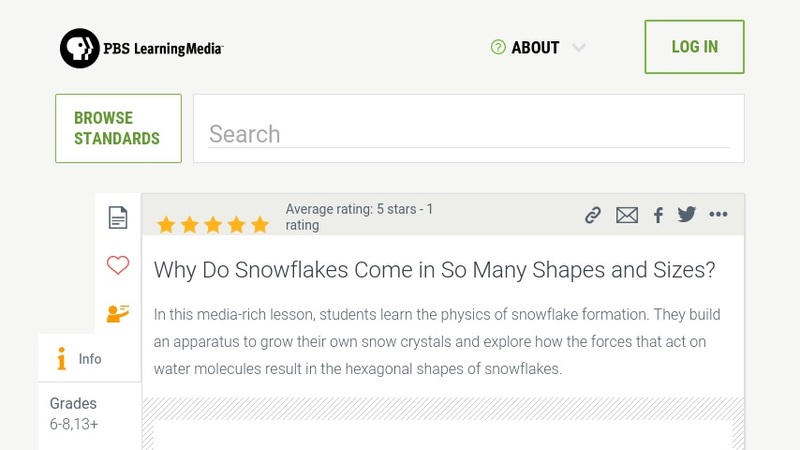 Teachers' Domain: Why Do Snowflakes Come in So Many Shapes and Sizes? This multimedia lesson for Grades 7-10 explores the physical forces that act in concert to create snowflakes. Students build an apparatus that creates conditions similar to a winter cloud and produce their own snow crystals indoors. By watching the snow crystals grow, they learn about how snowflake size and shape is determined by the forces that act on water molecules at the atomic and molecular levels. Digital models and snowflake photo galleries bring together a cohesive package to help kids visualize what's happening at the molecular scale. Editor's Note: This lab activity calls for dry ice. See Related Materials for a link to the NOAA's "Dry Ice Safety" Guidelines, and for a link to snow crystal images produced by an electron microscope.